Based on my “Weekly Energy Tips” emails, this is a compendium that can help you stay connected to your soul. This book is jam packed with information teaching you how to live life now, rather than survive. From exercises to observations, from practical advice and new ways of looking at things, this book could change your life for the better, forever! This book could really help you improve your life. Abby this so helpful. I think of all the time I tried to repress anxiety and fight it. Never worked. It just got bigger and bigger. Peace to you. Thanks again. Abby Wynne has a way of writing that nourishes my soul. There are countless positive, inspiring tips in this book, plus great visualizations to do while meditating. Reading this book, raises my vibration and leaves me feeling positive, and cleansed, and happy to be alive. I so enjoy your weekly newsletters. Your advice has such wonderful reminders for me. And to have it all in the one place, I love this book! Every once in a while a book comes along that inspires the soul. 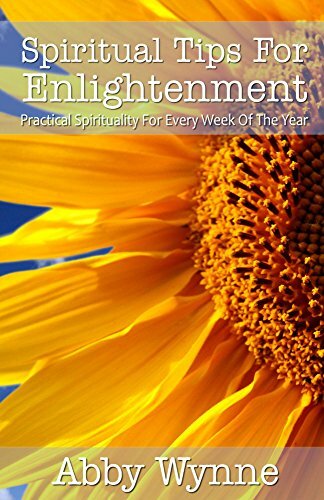 Abby Wynne’s book Spiritual Tips for Enlightenment does just that. Page after page she amazes us with truth and beauty and the power of healing. It should be on everybody’s life reading list. Professor Emeritus, University of Pennsylvania, Graduate School of Education. You are very inspiring and uplifting and your messages come through right when I need them most! I just carry this book around with me and it opens exactly where I need it! I love reading anything Abby writes. This book is in my night stand and I refer to it when needed. When you do something every day, it becomes part of who you are.